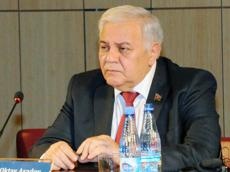 Azerbaijan hopes to develop all-round practical cooperation with China, said Speaker of the Azerbaijani Parliament Ogtay Asadov during a meeting with Chairman of the Standing Committee of the National People's Congress (NPC) Li Zhanshu in Beijing, China. He noted that the friendship between Azerbaijan and China is expressed in ancient historical traditions and a powerful development of mutually beneficial cooperation. “Azerbaijan is one of the first countries that responded to the “Belt and Road” initiative, and hopes to develop, together with China, all-round practical cooperation for the benefit of the two countries and their peoples. The parliament intends to make an even greater contribution to the friendship with China, passed down from generation to generation,” the speaker said. When talking about China-Azerbaijan cooperation under the framework of the Belt and Road Initiative, Li Zhanshu said that China is willing to follow the principle of achieving shared growth through discussion and collaboration, and carry out closer cooperation with Azerbaijan in areas where the two sides have complementary advantages. He said China has always supported Azerbaijan in exploring a development path suitable for its national conditions, and supported Azerbaijan's efforts to realize its economic development and national prosperity. Li Zhanshu went on to say that the NPC attaches great importance to strengthening inter-parliamentary ties with Azerbaijan. He called on both sides to implement the consensus reached by the two countries' leaders and make sure that bilateral trade and investment will be protected by law. Li Zhanshu also expressed hope that the NPC and the National Assembly of Azerbaijan will increase exchanges at various levels, share governance experience, and support cooperation in education, youth exchanges and tourism. China became Azerbaijan’s fourth largest trading partner in 2017. Customs data of Azerbaijan estimated bilateral trade at a record close to $1.3 billion in 2017, up 33 percent from the previous year. Exports of Azerbaijani goods amounted to $433.8 million, while imports of Chinese products to Azerbaijan reached $854.5 million.